It is career oriented Program which will help students to learn new technologies and achieve career objectives. Training and Internship Program is launched in technical fields like Web/Game/Android App Development and Hacking. It is 5 week training program. In first 2 weeks technical training would be given to students & in next 3 weeks home based projects would be given by us so that students can actually try their skills directly on a properly executed & structured problem statement. It would be 5 Week Training Program-me. In first 2 weeks technical training would be provided and in 3rd week, project would be given to participants so that students can actually try their skills directly on a properly executed & structures problem statement. Students can do the project from home. Proper assistance would be provided during their project development. 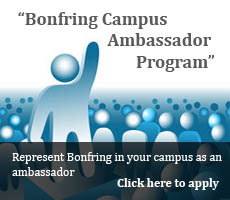 Certification of successful Training and Internship would be certified by Bonfring. All Engineering, Science Graduates, MCA, MBA, PhD students are eligible for this training, basic Criteria is knowledge of Internet. Basic knowledge of any programming language would be a plus point. The cost of training would be 4500 INR (It includes free CD and all the content of Training).